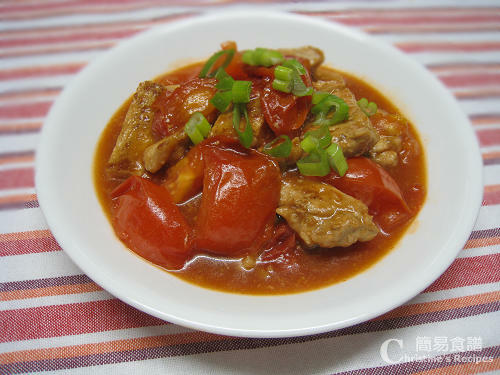 This dish, Pork Chops in Tomato Sauce is best served with white rice. My mother really knows how to cook the tomato sauce just right to our taste, sweet but not too sour. I liked her way of cooking tomato sauce so I follow until now. She is very clever to choose the brown sugar in pieces, not white sugar, that perfectly matches with the taste of cooked tomatoes. I won’t taste the delicate balanced effect if white sugar is used. So I keep using my mother’s way to cook tomato, until I learnt from my mother-in-law how to prepare tomato. She deseeds tomatoes before cooking every time. This trick makes the strong sour taste of tomato go away and helps us enjoy eating tomatoes even more. Well, I didn't peel the tomatoes because the tomato skin could retain good looking, avoiding from being turned into a mess easily while stir-frying. Do you have any tips on how to cook tomato sauce? Welcome to drop a line in the comments. Rinse pork chops and pat dry on kitchen paper. Tenderize with the back of a chopper. Marinate at least 20 minutes. Heat oil in a frying-pan or wok over medium heat. Add pork chops and cook until both sides are lightly brown. Dish up and set aside for 10 minutes. Wait until juice absorbs, cut into pieces. Add oil and sauté minced garlic. Toss in tomato chunks. Sprinkle with salt to your taste, add water to cook and bring it to the boil. Stir in sugar and ketchup, covered. Cook until sugar dissolves and tomatoes soften. Toss back pork chops, quickly stir well and cook for a little while. Add thickening to your preferred consistency. Dish up. Garnish with spring onion. Done. umm everything looks so goood! I just tried this recipe - quick and simple, and tasted really good. Thanks! Hello,I tried this recipe and it turned out really nice! It becomes one of my family fav. Thanks! But for making this dish, you can use either one. Not problem at all. Hi Christine, this recipe is really yummy!! Made it last night. Thumbs up!